Built by our Elite Tier overclocker Ian 8Pack Parry this bundle was designed and produced to give you the ultimate upgrade option. Designed and tested by the world's #1 overclocker, Ian (8Pack) Parry, the 8Pack Xtreme Bundle is designed to offer the ultimate upgrade solution. We use hand-picked processors so that we can provide a 24/7 stable overclock even at this ludicrous speed of 4.15GHz. We pair this with the superb Asrock X470 Taichi Motherboard with 16GB of insanely fast 2666Mhz DDR4 memory to make your rig ultra-responsive. To keep the blazingly fast CPU cool, we have selected a range of watercooling kits to help combat the extra heat and keep your bundle running at optimal temperatures. Each bundle is personally overclocked and tested by Ian (8Pack) Parry. - 16GB of 2666MHz Teamgroup memory with alternative options available - Giving you plenty of bandwidth for both gaming and professional applications. Please note the memory will be running at 2666Mhz but will have the capacity to run at 3000Mhz as the BIOs is updated by Asrock. 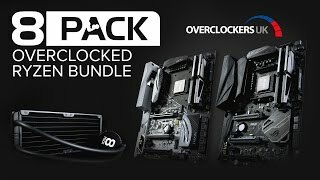 - Pre overclocked for your convenience! - No need to worry about multipliers and voltages, 8Pack overclocks the bundle to a rock solid 4.15GHz! - Protected by our superb 3 year support package! - As enthusiasts, Overclockers UK know just how disappointing it is when something happens to your rig, especially if you are in the middle of a game. Luckily we provide a 3 year warranty (36 months collect and return) and support via phone, webnote or forum to ensure we get you back up and running as quickly as possible. Processor Ryzen 7 Eight Core 2700 (Socket AM4) Processor Overclocked to 4.15GHz to give you a huge performance boost. CPU Cooler We have a selection of watercooling kits available from XSPC and OcUK Tech Labs, these include all you need to get your system up and running. Please allow 14 working days for your bundle to be built and configured. This may take longer during busier periods. Overclockers UK recommend using a high quality power supply, such as the Superflower HX and Leadex range. Some of the CPU coolers and watercooling kits require a large amount of space and/or specific mounts on the case. Please ensure that your chassis is compatible before you purchase. More links for "XTREME X470 ASROCK TAICHI - AMD RYZEN 7 2700 @ 4.15GHZ - OVERCLOCKED RYZEN BUNDLE"